Free Wi-Fi a gym and complimentary continental breakfast with hot waffles leads to comfortable stays at Ramada Rock Hill. All 124 contemporary smoking and non-smoking rooms at the two-story Ramada have free Wi-Fi coffeemakers and cable TVs with premium channels. Desks and armchairs are also in every room. Express check-in and check-out simplify arrival and departure. Begin mornings with the complimentary continental breakfast including hot waffles. Afterward go for a swim in the seasonal outdoor pool or work out in the gym. A laundry area business center and meeting facilities are on site. Parking is complimentary and pets are allowed for an additional fee. 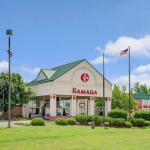 Ramada is located in Rock Hill just off of I-77. Thrills at Carowinds Amusement Park are had with a 15-minute drive. Learn about flight at the Carolinas Aviation Museum less than 20 miles way. The NASCAR Hall of Fame is also within 20 miles. Catch a Bobcats game at Time Warner Cable Arena a 30-minute drive. Charlotte/Douglas International Airport is 23 miles.